Comic-Con will release the badge sales date and time via email to everyone who has registered for a Member ID. Please check your e-mail frequently. Facebook, Twitter, and RSS announcements will come later. If you are not receiving notifications through SMS, you need to review your Facebook settings or contact Facebook directly. CCI does not send out announcements via SMS. Due to the large number of Member ID accounts, it can take a few hours for our email notifications to go out in batches. If your friend or family member receives an email notification before you, please hang tight and be patient. Yours will arrive shortly. We are aware of this delay and have scheduled badge sales accordingly. Because we hope to improve the efficiency and speed of the EPIC online registration system, we are requiring that anyone who wishes to purchase, apply, or register for Comic-Con badge must sign-up for their own personalized “Comic-Con Member ID”. SDCC Volunteer Registration Is Open! don’t expect it to say open for long though. It seems that spots fill up fast! Visit https://secure2.comic-con.org/memberid/ and login to your Member ID account. At the bottom of the “Member ID Change Menu” you will see a Volunteer button next to “Volunteer for Comic-Con 2012″. Click this button and complete your application. You do not have to enter your contact information as we already have that information on file from your Member ID account. When volunteer registration closes, the Volunteer Department staff will go through the applications and prioritize first by returning volunteers, then by new volunteer applicants (starting with earliest date/time stamp). Confirmations will be sent to those who are accepted into the program within 10 business days. “Not Accepted” notices will also be sent within 10 business days. Good luck and I hope to see you at the show! w00tstock 4.0 Tickets On Sale Now! For the third consecutive year, w00tstock is returning to San Diego during Comic-Con! Once again it’ll be on the Thursday (July 12), and they’re bringing the show back to the Balboa Theatre, a few blocks from the Convention Center. I think I just heard the universe explode! Star Trek: The Next Generation® crew and the Doctor face off ? San Diego, CA (February 13, 2012)—In conjunction with BBC Worldwide Consumer Products and CBS Consumer Products, IDW Publishing will make history when two of the greatest science-fiction properties of all time come together in a comic book for the first time. The world’s most popular time traveler teams up with the U.S.S. Enterprise crew in STAR TREK: THE NEXT GENERATION/DOCTOR WHO: ASSIMILATION2, taking fans on an adventure where no man has gone before. Launching in May, STAR TREK: THE NEXT GENERATION/DOCTOR WHO: ASSIMILATION2 will feature fan-favorite villains the Borg and the Cybermen as they create an unholy alliance resulting in potential disaster for all humanity. Captain Jean-Luc Picard and the crew of the U.S.S. Enterprise find themselves joining forces with the Doctor and his companions, with the fate of the galaxy hanging in the balance. “We are excited about this new adventure for the Doctor and the fact that he will be travelling with Captain Jean-Luc Picard and his iconic crew. This is a perfect partnership for not only Doctor Who’s incredible fans, but also for the brand. We have just celebrated our most successful year yet. Doctor Who’s latest season delivered record ratings for BBC AMERICA and it was most downloaded full TV seasons of 2011 in the U.S. on the iTunes Store,” says Soumya Sriraman, executive vice president Home Entertainment and Licensing. This eight-issue series will be written by Scott and David Tipton, the authors of critically acclaimed Star Trek: Infestation, with a helping hand from longtime Doctor Who writer Tony Lee, and will feature fully painted artwork by J.K. Woodward (Fallen Angel). Fans are encouraged to ask their retailers about the rare wraparound photo cover. Plus, artist Joe Corroney (Star Trek Ongoing) will provide a variant cover featuring the Doctor and friends aboard the U.S.S. Enterprise. Doctor Who and Star Trek are two hugely successful franchises that began as television series, and have expanded into a number of other media, including comic books, which continue to captivate fans all over the world. Nearly five decades and 1,500 episodes in the making, this is the moment that both Trekkers and Whovians have waited for all their lives! 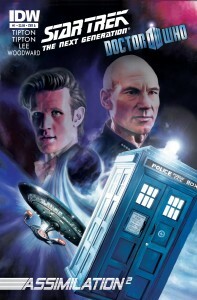 STAR TREK TNG/DOCTOR WHO: ASSIMILATION2 ($3.99, 32 pages, full color) will be available in stores in May 2012. Connect with Doctor Who on Facebook, Tumblr, and BBC AMERICA’s Twitter. IDW’s critically- and fan-acclaimed series are continually moving into new mediums. Currently, Jerry Bruckheimer Films and Disney are creating a feature film based on World War Robot, while Michael Bay’s Platinum Dunes and Sony are bringing Zombies vs. Robots to film. BBC Worldwide is the main commercial arm and a wholly owned subsidiary of the British Broadcasting Corporation (BBC). BBC Worldwide Americas brings together all of BBC Worldwide’s businesses in North and South America. The company exists to maximize the value of the BBC’s assets for the benefit of the UK license payer, and invests in public service programming in return for rights. The company has seven core businesses: Channels, Sales and Distribution, Content and Production, Consumer Products, Digital Media, Magazines, and recently formed Brands, Consumers & New Ventures. Under these businesses fall two key brands in the U.S. – digital cable channel BBC America and a bi-coastal production arm responsible for the smash hit Dancing with the Stars for ABC.